Highly Modified Asphalt (HiMA), a technology developed by Kraton, is designed to enhance durability and processability in asphalt pavement applications. The technology has more than twice the polymer loading of ordinary asphalt, which makes the asphalt act like asphalt-modified rubber instead of rubber-modified asphalt, enabling it to be more resistant to fatigue and deformation. The HiMA mixes are readily workable and easy to lay in the field, enhancing construction efficiency and performance. HiMA significantly improves the structural pavement’s resistance to rutting and cracking under most circumstances, leading to longer product life. Thinner pavements can achieve equivalent engineering properties, and the asphalt layer’s upfront reduction and paving costs typically offset additional HiMA polymer loading. Both scenarios deliver reduced life cycle costing. This technology also enhances surface durability, increasing resistance to cracking and rutting since thin lift asphalt overlays and inlays, and micro surfacing treatments are regularly used to protect existing pavement from weather and traffic load stresses. Kraton is committed to proving and advancing our innovations. We collaborate with several third-party agencies and regulatory bodies to ensure we work towards solutions that address transportation needs. Kraton was an asphalt test track sponsor with the National Center for Asphalt Technology (NCAT) at Auburn University. We constructed a HiMA section on the 1.7 mile track in a control group, and since the test track cycle commenced in 2009, Kraton tested the technology on section North 7 for five years as a structural pavement construction. Results were that even though the HiMA section is 18 percent thinner than the control group, after 5-plus years and 20,000,000 axle loads of heavy truck traffic, it showed only one-third as much rutting and no bottom-up fatigue cracking. As part of the Transportation System Preservation Technical Services Program (TSP2), Kraton has worked with the National Center for Pavement Preservation (NCPP) at Michigan State University to develop a HiMA thin lift asphalt specification. The program, sponsored by the American Association of State Highway and Transportation Officials (AASHTO), includes 10 participating US Department of Transportation in northeastern states and Professor Walaa Mogawer, the director of the Highway Sustainability Research Center at the University of Massachusetts Dartmouth. 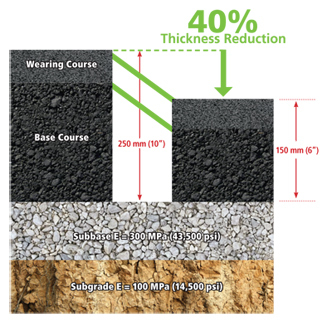 HiMA can solve a variety of asphalt pavement challenges since the technology for asphalt base courses allows pavement thickness reductions of 30-40 percent, delivering cost savings upfront.